James Cook University @jcu censures a climate skeptic – help him fight back | Watts Up With That? UPDATE: I made this a “top post” that will remain at the top of WUWT until we reach the goal. New content will appear below. UPDATE2: as of 12:30 PM PST on 2/2/18 we are within 5% of reaching the goal. If you haven’t already, now is the time to help. I am astonished, very relieved and most importantly incredibly grateful for the support. I would also particularly like to thank Anthony, Jennifer Marohasy, Jo Nova, Willie Soon, Benny Peiser and many others for getting the issue up on blogs and spreading the word. Now we have this announcement from Dr. Jennifer Marohasy, reposted below. I ask three things of our readers. Retweet and repost this story wherever you can, Twitter, Facebook, blogs, etc. To show support, buy a copy of the book in which he says the Great Barrier Reef alarmism is just that. If possible, donate to his campaign to fight back against the university- link below. 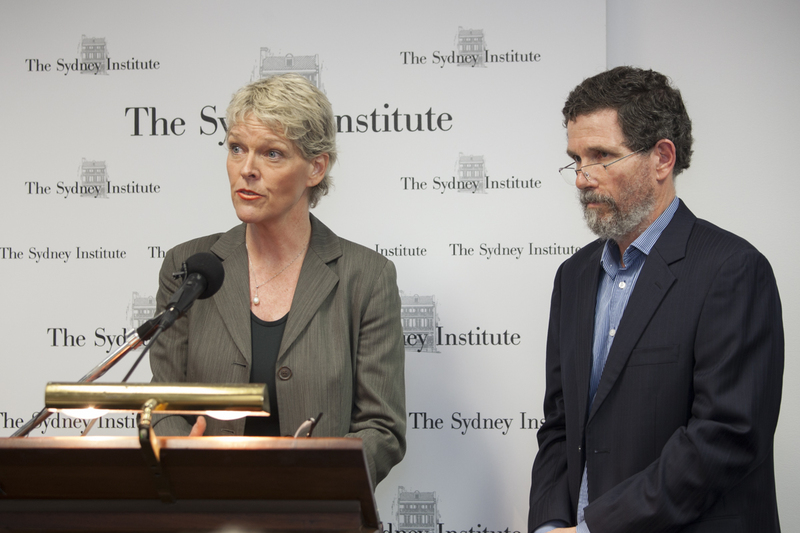 Peter Ridd and Jennifer Marohasy speaking about the need for quality assurance in science last November in Sydney. PROFESSOR Peter Ridd is a physicist at James Cook University who has dared to question scientific findings that purport to show the Great Barrier Reef is in trouble. Specifically, he has been formally censured by the University and told to remain quiet about the matter – or risk his job. The issue dates back to August 2017, and comments he made on television promoting the book I edited last year – Climate Change: The Facts 2017. Peter wrote the first chapter in this book, and in it he suggests that there are major problems with quality assurance when it comes to claims of the imminent demise of the reef. He has also published in the scientific literature detailing his concerns about the methodology used to measure calcification rates, including a technical paper in Marine Geology (volume 65). After some reflection over the last couple of months, and some thousands of dollars on legal fees – so far paid by the Institute of Public Affairs (IPA) that first published the book that got him into trouble – Professor Ridd has decided to fight the final censure. In short, he has decided he would rather be fired than be quiet. But he is now going to have to find about A$95,000! So, this university Professor has set-up a crowdfunding account. It is now your turn to show support and help fight the case. 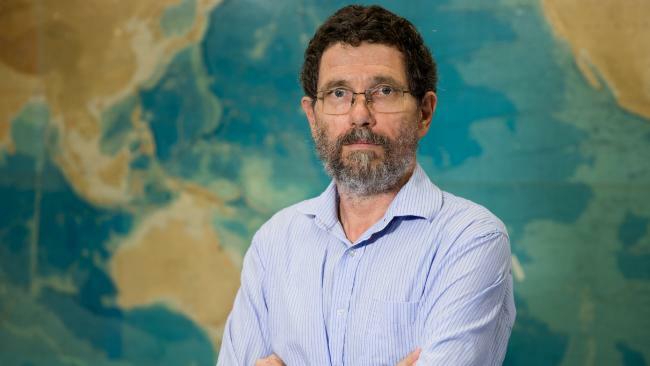 Marine scientist Peter Ridd has refused to accept a formal censure and gag order from James Cook University and expanded his Federal Court action to defend academic freedoms and free speech. A revised statement of claim alleges JCU trawled through private email conversations in a bid to bolster its misconduct case against him. JCU had found Professor Ridd guilty of “serious misconduct”, ­including denigrating a co-worker, denigrating the university, breaching confidentiality, publishing information outside of the university and disregarding his obligations as an employee. Professor Ridd has asked the Federal Court to overturn the university ruling and confirm his right not to be silenced. In the revised statement of claim, Professor Ridd has dropped an earlier claim of conflict of interest against JCU vice-chancellor Sandra Harding, but has alleged other senior staff had been biased and had not acted fairly or in good faith. Professor Ridd’s Federal Court action is seen as a test of academic freedom and free speech, and has been supported by the Institute of Public Affairs. Professor Ridd said he would seek public donations to continue the fight against JCU. He first took court action in November in a bid to stop a JCU disciplinary process against him for comments he made to Sky News presenter Alan Jones. The university said by expressing concerns about the quality of some reef science, Professor Ridd had not acted in a “collegiate” manner. He said a lot of the science was not properly checked, tested or replicated and “this is a great shame because we really need to be able to trust our scientific institutions and the fact is I do not think we can any more”. A JCU spokesman said the university’s lawyers had invited Professor Ridd to discontinue his proceedings. “(He) has amended his proceedings. His decision to do so is a matter for him,” he said. Lawyers for JCU wrote to Professor Ridd on November 28 confirming the university had determined he had engaged in “serious misconduct” and issued him with a “final censure”. “The disciplinary process and all information gathered and recorded in relation to the disciplinary process (including the allegations, letters, your client’s responses and the outcome of the disciplinary process) is confidential pursuant to clause 54.1.5 of the university enterprise agreement,” the JCU lawyers said. Professor Ridd has subsequently published his concerns about the quality of reef science in a peer-reviewed journal. He said he was determined to speak freely about his treatment “even though it will go against explicit directions by JCU not to”. “This is as much a case about free speech as it is about quality of science,” he said. Again, I ask three things of our readers. February 1, 2018 in Climate ugliness. Love to send him some money but the site won’t recognize by Discover Card. mods what’s up? We don’t manage the GoFundMe site…so I don’t know what to tell you…sorry. I live in Australia and initially it rejected my donation. Rectified by reloading Australia as the country in the drop down menu. Probably you might need a ‘mainstream’ card. Seemed to work ok with my GB Visa card, so gave my widow(er)’s mite. Funding seems to be going well at present, but will repeat if required. Rodney Hackett in for the slam dunk – $5K > $99,312. Whoom! As far as Australia is concerned PROFESSOR Peter Ridd is a candle in the wind. When will sanity come to that country? A long way from sanity here, my own feeling is that the progressives are more aggressive towards ‘non believers’ of any of their political ideology in our country. The news media here is nearly left leaning with all the expected coverage and opinions that come with that. There are a few of us attempting to wake the sheeple and critically think and reason, but its a battle, especially when ‘feelings’ are used to justify a position. I strongly expect never. The groupthink mental illness of liberalism is a function of easy-living reality-divorced coastal metroplises. For obvious ecological reasons Australia is mostly comprised of those benighted tumours. I’ve donated, and I hope others will also. As a benchmark, the total stood at about 26,650 when I first posted the story. That total represents 24 hours. Tried to donate but the expiry month drop down will only go as far as April. Robert, it only shows 4 months in the drop down box – but there is a slider to give access to the rest! Is anyone in communication with Dr Jordan Peterson? This is certainly within the realm of his fight against the universities and I am aware he’s been making bank through crowd funding. The reason I suggest this is because his current exposure is walking up the masses to logic and reason, self awareness, and personal responsibility. I could see him potentially donating since decent money and/or providing another medium for exposure. I’ll donate money Friday when my Trump tax incentive hits my account. Our company just gave everyone a grand, so after the theft I stand to see $600. I’m sure I could throw $100 at it. I thought the same, it would be fantastic if Jordan Peterson mentioned this case! Note that the donation is in Australian dollars, which is 80 cents to the US dollar, so a $125 AU donation will only cost $100 US. As per CAGW profiteers’ standard operating procedure, Professor Ridd was declared guilty of wrong-think and informed of his penalty. Any hearing will simply confirm the verdict. Science in Australia is threatened. Stand up! Please don’t forget our host that brought us here. There’s a button somewhere. It is difficult to know which imminent demise he is talking about as they come along every three years. One of the few times I’ve felt compelled to participate financially. What ever happens now let us not forget that JCU is off the spectrum as a respected scientific university. Until they rejoin the true scientific community just treat them as a. Joke. I did read somewhere that this was intentionally instrumented by a former Labor (left/socialist/green) government! A show trail and mafia style threats , just what has that to do with science? Sadly now the university has gone ‘all-in’ they cannot now publicly back down. And if he wins any court case he will find , they will neither forgive nor forget the lose of face which of course they will take no ownership for. Best he can hope for is an under the table deal and someone from HR , not necessarily the right someone , being thrown under the bus. Once upon a time the Roman Catholic Church’s trial and censure of Galileo was used by thinking academics as an example of how critical thinking and science should not be persecuted. I guess those at James Cook U missed that lesson. Galileo was never censured for his science, but rather for his commentary on theological matters. Was Galileo an athiest? If so my respect for him has increased immensely even though He already has always been considered the Grandfather of Astronomy. Of course not, he was a Christian . . that’s essentially where/who science (in the modern sense of the word) comes from; Christian intellectuals. Even in recent times, about two thirds of all Nobel prizes in physics, chemistry and medicine were won by people who self identify as Christians. Does that do anything to boost your respect of Christians/Christianity? Saw this on the Global Warming Policy Foundation site and donated. Well worth it!! I predict they will try to have GoFundMe remove the Professor. Anyway, made a small donation and passed the WUWT post onto a couple of colleagues…I’m not into social media! Will buy the book too. This is an important battle. Donated and distributed to my colleagues in my university. Can you post the letter you sent to your MP please, I would like to do something similar but I’m not sure where to start. Suitably redacted of course. I just sent this to JCU via their engagement@jcu.edu.au email. I’m planning to build from this for my local MPs here in FNQ. Your actions against Professor Ridd are becoming big news throughout the scientific community and not in a good way. As a taxpayer, a resident of FNQ and a science enthusiast I am very, very disappointed in JCU. Since JCU was established under state legislation I presume you’re bound by the Public Sector Ethics Act, 1994. How do you account for your censure of Ridd in the context of your responsibilities under that legislation? Secondly, would you please explain how censuring Ridd benefits good science, particularly in light of past upsets of ‘consensus science’ (e.g. eugenics, plate tectonics, heliocentrism, lunar crater formation and stomach ulcers)? Excellent, thank you. Suitably modified version has been sent from me. The Left eating their own, been reading up on it lately. on my moms side, my grandma Cook being the proof. If a university tried to silence a global-warming believer, we would hear screams of ‘censorship’ and ‘anti-science’ from all around the globe. Why isn’t it censorship and anti-science to silence any scientist? Why not invite healthy debate? If you can’t defend your position against the naysayers, you really don’t know as much as you think you do. These people are the same type who would want to silence Albert Einstein for questioning anything to do with the “established science” of Newtonian physics. And may I suggest that we stop using the left’s pejorative term “climate denier.” Let’s use “climate realist” or something similarly positive and accurate. Climate + scientist akin to witch + doctor. Also “political correctness” is really “progressive conformity”. PC is really “leftist tyranny”. How about Climate contrarian or panic-party pooper or nattering-nabob naysayer? Or a doomsday dissenter or doomsday denier. ‘Heretic’ seems to be the more precise substitute sobriquet for the nonsensical term “climate denier”. Donated. And a reminder to my fellow Americans regarding the U.S. to Australian dollar exchange rate. The donation site is for contributions in Aussie dollars from what I can tell. The link below should allow you to determine your donation in U.S. dollars using the current exchange rate. Currently, the exchange rate is about $0.80 USD per Australian dollar. For example, $25 Australian would be a little over $20 USD. Keep this in mind when donating. James Cook University at Townsville scores an own goal yet again and once more it’s not in the field of academic excellence or useful or original scientific research. Thanks. I was able to buy the book and make a GoFundMe contribution. Reminds me of online social media contracts that say we will bill you $X if you post anything negative. We just have to keep letting people know JCU is no longer an acceptable University and make sure that government support is cut. Donated and shared on Facebook. WUWT can we have a weekly Posting on Peter’s work during Feb so this cause isn’t forgotten after a day? Or at least keep the post at the top for a few days…..
Good to know that you have your eye on the float. I am a little concerned that Theresa May will give away our fishing grounds then declare that information to be “fake news” and have it removed from the airwaves by her new censorship department. I trust that you are happy in the knowledge that censorship is the first step towards tyranny. We, the proletariat, are not so stupid as to require a Government department to tell us what they deem to be fake news. Attempted censorship in any form can only be destructive to democracy. Even though this is a quote from the less venerable source “Wikipedia”, it is a valid summary of the IPCCs 1990 report in this regard. There are two (or consequently even more) major and decisive flaws in this. 2. and most obvious, you can not argue clouds emit 31W/m2 downward, but nothing upward. Even though clouds might be somewhat colder on their top than on the bottom, they will emit roughly the same amount of radiation upward as downward. 3. Accordingly, as both emission parts will largely even out and denying downward reflections of terrestrial IR, you would end up with net negative CF in the magnitude of their total albedo effect, which is obviously non-sense. 4. If however you accept, that total “downforcing” by clouds will be similar (even if it were somewhat smaller), than total “upforcing”, and the latter amounts to about 110W/n2 (=79W/m2 albedo effect + 31W/m2 IR emissions), then the downforce part will consume most of the GHE of 155W/m2. 5. If you furthermore allow for the fact, that surface emissivity is not 1, but rather 0.92, that will account for another 30W/m2 of the GHE, and essentially nothing remain. You can then determine the GHE due to GHGs, by the formula 155 – 30 – 110 – net CF, or 15W/m2 – net CF. If you assumed net CF to be -13W/m2, as the IPCC states above, that would yet be only 28W/m2. Of course, the complete story looks even worse.. Consider: clouds are colder on top than on the bottom. Why? Because on top they have radiated energy to space that was not reflected by the ground. I am saying that there is not necessarily any difference in how much energy is lost from cloud tops and bottoms. Your point 2 leaves the impression it might be less. It is probably more and certainly no less. If you measure the temperature of a brown stove, and again after painting it black, the black stove will be cooler. It is cooler because it is more effective at shedding heat. Temperatures must be considered in the context of a dynamic relationship with other objects. Heat is perpetually on the move. I think the cooling by clouds is far more than even you have suggested – on the order of a few hundred Watts per sq m.
Well .. the point about point 2 is, that the consensus model insists on no upward emissions at all. It is freaky claim which very much serves as a foundation for the whole GH-model. It would not work without. Were these comments meant for a different thread? Donated. Total up to over $35k at 4:11 p.m. CST. Let’s help this guy! Notable that the cowardly bigwigs at JCU obviously prefer to hide behind the organisational facade than engage – using what I assume to be public funds and the status attached to a prominent university to harass / gag a dissident informed independent voice. Australian political hacks / warmists have a track record of going after people’s jobs when they can’t / won’t address a challenge by using actual evidence. As ever – there are individuals behind the attack on Peter Ridd – I think it would level the playing field somewhat if his accusers / persecutors got a few namechecks out on the Internet at least …. Anybody know who they are? If Australian jurisdictions are anything like Ontario’s, or Canada’s, it’s your whole political and educated class who are responsible for the tax payer funded climate change fiscal fiasco. And only time will tell. If the climate cools, or anyway the Pause resumes, they’ll be the ones to blame for steering us in the wrong direction. Perhaps the Pranksters on Olympus have set them up for a fall. O how they deserve it! i will second that tomo . I don’t know who the aggressors are on this but I would have thought that the university itself should be called on the carpet in legal terms for promoting a biased and scientifically skewed perspective. One assumes the same bias is rammed down the throats of the poor kids who make the mistake of enrolling there for an impartial education. One also assumes this university receives public money to blow on unfair personnel decisions and resulting legal processes. John there are a lot of jobs at stake and the university’s reputation, so they’ll continue to dig a deep hole. Ultimately JCU will have egg on its face because coral bleaching has nothing to do with AGW and everything to do with strong El Nino. Sea level falls in the western Pacific, exposing the shallow coral to bleaching, but such thoughts should never be uttered if you want to keep your job. A conspiracy of silence evolves and locks out dissenting voices. I’ve added some more Canadian Shekels to yours. $25 bucks to the legal fund for Prof. Ridd. The total amount raised is now over $40K, up more than $3000 during the few minutes from start to finish my donation (at 6pm EST). Utterly disgusting. Even if Peter Ridd is wrong, which I doubt, he should still feel free to speak his mind. Otherwise what is the point of academia? The problem isn’t the point. It is the hand that holds the shaft. The question is whether he is allowed to criticise the system outside of it , or only do it through internal processes. Same sort of thing as contempt of court. I’m not sure. Makes my blood boil. Of all the inquisitional things to do in the modern world. Gee, why aren’t those SJWs changing thd name of the university????? Donated! But found Gofundme then tried to grab me and link to all sorts of other stuff I have no interest in and ended up having to exit and return. Peter Ridd’s case is essential to freedom of speech and academic rigour. Both these are under severe attack in Australia as elsewhere. I just donated. I am very frightened by the way bureaucrats behave in all aspects of Western society. Instead of protecting citizen rights they are only interesting in policing or squashing them for the “common good”. You could easily substitute “common good” or “mother Gaia” with “The Fatherland” – basically the “collegial behavioural requirements” demanded by JCU is double speak for a fascist controlling bureaucracy. Fascism is rampant today but nobody sees it. The last time fascism raised its ugly head in the West it was pretty much ignored until Fascist boots marched all over Europe in a “collegial spirit”. The belief that there is only one truth and that oneself is in possession of it, seems to me the deepest root of all that is evil in the world. Shared on Facebook and bought the book. I donated a few hours ago. The amount raised is up $20k since my donation. Let’s keep up the awareness. Anyone think of “reaching out to” Jordan Peterson? This stuff’s right up his alley. Gaglileo is turning over in his grave. If Big Oil and Big Coal are on the thread, here’s a great place to put some of that Big Money of yours. Hard to be a real scientist these days when the green gestapo are bullying . I wasn’t aware that the definition of the scientific method included acting in a “collegiate ” manner . threated to punch out another scientist who wasn’t playing ball . And the discipline for that was what ? .. That’s right SFA . place that encourages freedom of thought and fearless discussion . I tried to donate but it wouldn’t accept my credit card number – said it was invalid. I entered it three times to make sure. The card is well under its limit. What’s that all about? Done! Bought the book and sent what I could afford. It’s times like this I wish I were a billionaire – I’d foot the whole bill for him. I thought I already had this book – but it was the other one: “Climate Change The Facts” (without the 2017 bit). All my favourite people are listed as authors so I’m bound to enjoy it. Just running the numbers off GoFundMe, as of 9:50pm EST, the AVERAGE contribution PER person is $118 (good on those that extended themselves). Just WOW!!! Yes, I checked that too. Anyway, I’m ready to double-up my retirement mite if required. I will be getting the book as well. MASSIVE response from defenders of free speech already through the ‘Gofundme’ page. PLEASE try to donate even as little as $5 (a takeaway coffee). 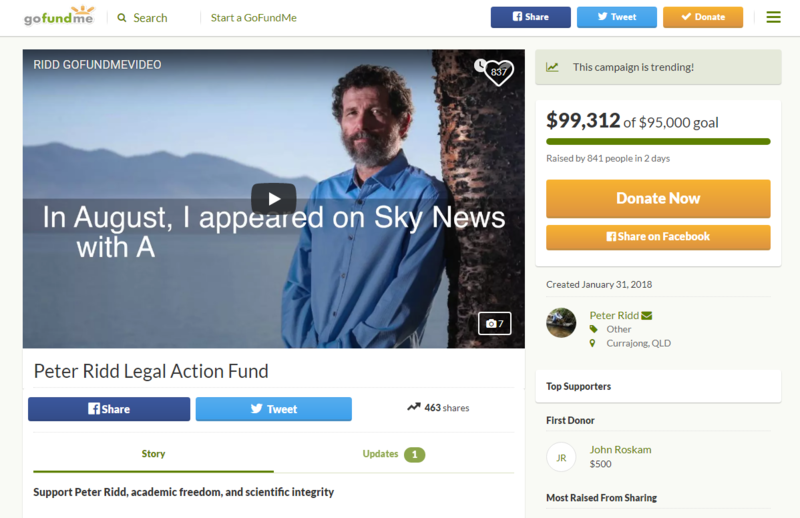 FUNDING Professor Peter Ridd’s legal fund helps protect freedom of speech and sends a very important message to supposedly “free-thinking” institutions that suppression of thought, ideas and opinion MUST NOT and cannot be stifled because these ideas disagree with the preferred wisdom of the day or a chosen ideology. This is totalitarianism that directly undermines freedom and democracy. DONATE today to help Prof Ridd fight @JCU and stick it to the tyrannical climate industrial complex. Donated and bought the book. As of Feb 2, 01:13 EST, total donated is $60,409 (AUD). An excellent example of the ‘Newman Effect’. Academics keep messing up their ‘wet work’ and benefiting their intended targets. Prof. Peterson had to ask for donations (all his lectures are online and free) when his funding was removed and 200 UofT faculty members tried to get him fired. He ended up “monetising the SJWs” to their intense frustration and anger. There is a commenter on Tim Blair’s blog who goes by the handle ScienceMichael but we suspect has a couple of other handles. He says he does science so I guess he has a degree but this guy is so science clueless it is amazing. If he really is a scientist then God help Australian research. Just over A$71k after my modest donation. Not far to go. The Australian universities are deeply corrupt. Once they have taken the huge fees from foreign students for 3 years ‘education’, they have no choice but to award them all a degree pass. Many of them can’t even read the exam papers. But they know they are sure to get a degree whereas, back home, they they would have to earn it. So everyone ‘wins’. Donated and bought the book. Anthony – thanks, this is fantastic. It looks like he might get his money in less than 24 hours. You should spread this far and wide. The more these fascists know that their victims are supported, the better. Maybe they’ll hesitate next time. Maybe a press release, try for a TVs news story…? I’m neither for or against, I’m open minded and happy for all people to speak their mind. I have had experience at JCU when it came to the GBR research when I was interviewed for a job there. I asked what the funding was going to be used for, ie what research. I was told that they had not decided yet, it was just important to secure the moment then think of the research later. The way research grants are handed out and the way they are conducted is a concern to me. for some reason wouldn’t accept my card on the go fund me site . .
Bought the book and made a small donation – the old adage “all it takes for evil to succeed…. ” comes to mind as it can be easy to ignore injustices from half a world away. This is a cause whose time has come. If Jennifer Marohasy will organize it, people will join! First time poster, but long time lurker. I already own the book, but I have donated and shared on Facebook. That was the first time since June last year I shared anything on there, so will probably not be seen by many. Then again, every little helps. It really is heart warming to see how this community can come together on important issues and (hopefully) have a positive impact. While I am here I want to give a big Thank You to all the regular and incidental contributors in these comment sections. At times, I get as much or more from reading the comments than from reading the actual articles. Your effort and patience is very much appreciated! -“Next in line are the amateur and professional (literally) climate change and reef decline deniers, who you’d think are feeling rather sheepish about this new science. One is Peter Ridd of James Cook University, who says things like “My general view is that the threats and supposed damage to the reef are greatly exaggerated”. But the big kahuna is coral reef expert Andrew Bolt. Bolt has been mocking scientists like Ove Hoegh-Guldberg (director of the Global Change Institute at the University of Queensland) for sounding warnings about the threat to the GBR from ocean warming and acidification. It does not seem, to the author of this piece, Prof Bruno of North Carolina , that Prof Ridd’ s comments are sufficiently appalling to cause him to lose his livelihood, back in 2012 anyway and the worst that can be said of the more heinous of the ” deniers ” , Prof Bolt, is that he engages in a “rollicking discussion”. This is not about science is it , its about money for JCU, currently 9th in the ranking of Australian Universities and No 360 or in the range 200-250 in World rankings (depending on which ranking scheme you choose). You use a lot of words to deny the facts that coral has always bleached and aleayscwill, and that OA, except in models, is undetectable in reality. You, like many fanatics, hope that by quoting verse and dismissing heretics because of their lack of standing (according to your circular reasoning) it can all go away. Not odd for a true believer. Hunter , “The Conversation” if you are not familiar with, it is an academic discussion / latest news forum , usually of a leftward slant. I thought that a topic concerning academic freedom would naturally appeal to its readers , but the only mention of Prof Ridd, and that in passing , is from 2012. Perhaps it is a bit too early. On the question of bleaching I have no definite views because I do not think that there is enough unbiased information available to the general public outside the screaming misinformation from the likes of the BBC and the Guardian. Given that Australia has a predominantly service based economy , of which tourism is an important part , the effects of scare stories concerning one of its major attractions should focus those political minds that have some responsibility for Australia’s financial well-being. In a well ordered society the obvious policy would be to hold a Royal Commission on the state of health of the reef and the effects of natural and human activities on its future. That might take 2 years or so , but would enable all persons with an interest , whether scientific, environmental or commercial to have a say without being muzzled or harassed by academic bureaucrats , financial backers or the media. good work anthony and wuwt. Thanks, high praise from the moshpit! Just donated and shared on Facebook. The treatment that JCU afford skeptics is the primary reason I abandoned any thoughts of doing a degree in Marine Biology there after spending more than a decade diving on the Great Barrier Reef. I see the fund has already raised over $80,000 that puts a smile on my face. Nick Stokes what is your op opinion? I spent nearly all of my career in quality assurance, and much of that career was spent defending against accusations of being a corporate “traitor”. My habitual crime? Reporting non-conformity against procedure. I see nothing particularly unusual in the treatment of Peter Ridd. When I had had enough of threats of physical violence and professional calumny, I just packed my bags and left them too it. That’s the way most quality assurance professionals end their career. Not with a bang but with a whimper. At least, that’s the demise of those who do not get sacked for doing their job. Or should I say, “…left them to it”? Yes, even QA professionals can make mistakes. Typos can be such a hooot. Donated, of course. Also bought the book. Donated. That Professor Peter Ridd is going through this is a testament that the Dark Ages was not a discrete event in human history. Very close in less than a day! Just added to it. Who could believe there are so many contrarians? Just donated. I have to stand up for my other “Unrepresented” pals. I wish the good Professor great success. Over $84,000 now with my little bit added. What the hell has happened to Australia? Exactly my question I have been asking recently. As an expat Aussie who has lived outside the country for the last 25 years.. when I read things like this I find Australia increasingly alien to me. As for the Australia Day celebration protests…don’t get me started. I think what has happened is that we are all now paying the price for allowing the leftist-progressive movement to slowly take over the education system, almost world-wide, or certainly in the English-speaking world anyway. And the output from colleges and universities since then are the ones who are now calling the shots. Absolutely my thinking. Western education system is nothing more than dogmatic propaganda. Instead of teaching children to think, they are taught to obey authority and to believe everything the system tells them dogmatically. History shows that the elite have been wrong about a great many widely held beliefs and without doubt the elite will continue to be so. In my short lifetime, “butter” was declared a pariah and margarine (trans-fat) the healthy cure for all our ills and then we found margarine (trans-fat) are worse for health …..and so it goes…. The government is not denying Mr. Rudd his freedom to speek… so far. There is no freedom to free speech at your place of employment. There are several legal grounds for action here, but the denial of free speech is not one of them. AGW is a political battle. Fortunately, there are not that many people in the US that are convinced that the problem is serious enough to alter their lifestyles one iota (hundreds of private jets to Paris prove that AGW’ers don’t). Unfortunately, the AGW’ers are armed with $Billions of our tax $Dollars annually AND a few $Billions worth of free propaganda by our lying press. Science is a method and system that oftentimes uncovers the truth about how the universe works. Unfortunately, political and financial interests can and often do add confounding factors to that pursuit of the truth. It is not a good day when so many scientists and journalists are willing to tarnish and abuse what should be sacred institutions (for the discovery and dissemination of the truth). It is true that they do. Hopefully, nature will be blindly kind to scientific and journalistic sanctity by cooling the Earth significantly for a decade or so, (which is not unlikely). That’s about the only thing that could dry up the flows of $Money to climate science and encourage journalists lie about other things (that don’t involve climate or science). I think the most important thing about the study of Physics is to keep mankind eternally humble. The volume of issues that we understand in the physical universe is dwarfed by the amount that we do not know and may very well never know. Thank you Professor Ridd for standing up for science and fighting against the forces of ignorance. Thank you Professor Ridd for standing up for science and fighting against the forces of ignorance. The opposition to his views don’t make sense, scientifically. Science depends on genuine, real-world observations. You have your hypothesis, you develop a measure that ought to be obtained if your hypothesis is true, and not obtained if false, and then you go gather that observation by the plan. You can have a forecast based on a range of scientifically known factors, such as calcification rates, etc., but the only way to scientifically know whether a forecast, or projection, or prediction, about the future is to wait SO THAT YOU CAN CARRY OUT THE NECESSARY, DE RIGUER OBSERVATION. With no observation, a forecast is never scientific. By definition. So, it is ridiculous to censure a critic. Finally: criticism and discussion of generally supported scientific ideas is part and parcel of science. If you cannot handle criticism, don’t try out for American Idol, and don’t get into science. Done, and it’s over $85,000 now. There’s a climate science prediction that is being validated as we speak. That also marks a new low in academic published debate. I forgot to add, “no insult to Captain Cook intended.” Rather, the implication was that a university named in honor of a famous Cook seems to be operating as though named in honor of a famous kook. Treating a level-headed critique as misconduct surely seems more indicative of a kook. I would hate to see the university’s reaction to a critique of it’s board’s favorite art work. They would probably go for the death penalty. Time to add another update: as of Feb 2 17:20 EST the total is $99,312 (AUD) — $4,312 over the goal. If Australian lawyers bill at a comparable rate to those in the US, this should be good for one or two hearings. We are so grateful for the support of everyone at this thread. (I’m so grateful that I’m now crying.) THANK YOU! While thinking about this issue during a long drive today I put on my CD “Something inside so strong” (by Labi Sifffre). Similar effect. We have passed another milestone in the fight. I saw this yesterday and immediately donated. Then I bought the book. I have read the first 2 superb articles by Peter Ridd and Jennifer Marohasy and John Abbot. I also read the final incredible article by Clive James. I can’t wait to read the rest. The article by Clive James is a masterpiece. Thanks Jennifer for putting this volume together. I encourage all to buy it and read it. What a fantastic FAST response to this appeal with hundreds of donations & in time measured in hours! It says more about the community of which WUWT is just a part then we currently realize. It also speaks of the power of GoFundMe but somehow I doubt they will use it as an example when looking for more business. – The site told me “There is a problem” when I tried to use my debit card. The bank declined an unusual transaction, but GoFundMe did not tell me that. I learned it from an email from my bank. I called the bank and was put on an eternal hold. I hanged up after 10 minutes. – My Discover card was flagged as an “incorrect card number”. With only two cards in my hand, I decided to fold. I would donate if I had some money but due to the fact my wife and kids are migrants and temporary residents, the Australian Govn’t feels it needs to take vast amount of tax from me and my wife as well as various expensive fees for various Govn’t services. Thanks To everybody especially Anthony for all the support. I really am astonished and incredibly grateful. We will fight this all the way. I just read your article in the book. I am a fan. I am dealing with a 19 year old granddaughter that believes all the pseudo science out there about the reef. I hope to broaden her perspective by gifting her a copy. Peter – I sort of wished you had kept it open but only accepted $5 donations. The speed at which the target was reached / surpassed was great but by keeping open you would have had another power stat and that would have been the number of people donating. Out of interest, how will JCU pay their legal bills? From the government grant money they so eagerly covet or in other words taxpayers, or are their private donors for that sort of thing? You obviously are not alone. Keep up the good fight. Congratulations to Anthony. He is a mobilizing force who’s name was “not to be mentioned” at one point in time! That time has passed and he is also not alone! Very nice job. Goal exceeded! All the best moving forward fighting back! Life is a highway, one way or the another folks. Make the best of it. Well done everybody and especially for the last minute donation of $5,000 by Rodney Hackett, who put it over the top! Just bought the ebook and tried to donate but now closed. I guess that is because the target has been reached. Ready and willing for a second round fund raise if required. I have been reading WUWT for years and am a confirmed skeptic – but am prepared to change my mind if someone out there can provide proof. I notice Mosh was the only one of the usual suspects to comment and credit to him for that. The others, Griff et al, are conspicuous by their absence. One can only assume they agree with the stance of JCU which just about sums them up. Well done Anthony and everyone else involved. Their silence means they possibly agree with Peter Ridd and are just too embarrassed to say anything. If they agreed with the JCU they would not hold back. Very proud of our lukewarmer’s comment actually. So sad that James Cook’s name has to be dragged through the mud with the idiocy and political correctness of this current university staff, but typical. In a comment at the end of a prior week’s TWTW thread Griff said he was dropping out because of the rudeness with which he had been treated. since Anthony went on sabbatical it has become very dull and 90% of this I can read on Breitbart, if I am that perverse: leftists = bad, Trump = good… and if I want to be called names and a liar, well what else are ex wives for? I regret that you have been “called names and a liar” on this site. You are much less objectionable than other warmists who have been regular posters here for a period. And this site needs a “foil” to present claims that are currently popular with our opponents, in order to post our rebuttals for the public to see. There has been a nastier tone and more focus on the person than on his/her arguments, among WUWT-ers in the past three years or so, and looser moderation. In 2009, when I started observing and then commenting here, and for several years thereafter, comments were not posted until they had been read by a moderator, who snipped or toned down insults. Too-aggressive commenters were warned or suspended for some period. Yes, there is a bit of that from a few. But Griff has nothing to complain about or blame but herself. And this site needs a “foil” to present claims that are currently popular with our opponents, in order to post our rebuttals for the public to see. You have been strongly moderated too for misbehaving in the threads, Griff was a chronic drive my commenter, who rarely replied to anyone about what he wrote, he also insulted a scientist and repeated the insult several times, not acknowledging the scientists background and research history at all. Climate Otter gave a devastating rebuttal to Griff’ insult, which was never acknowledged. He vanished from many places besides this one, without even a good bye note. Being polite he never was as many here knows well with HIS insults, drive by commenting behavior were exposed. He was even worse over at Tony Heller’s site where he lied a lot to the point that even mild people were calling him a liar loudly. The last time I was moderated here was five years ago. Before that, going back to 2009, I was moderated one additional time. You’re thinking of someone else.